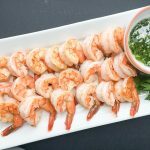 Oven Roasted Shrimp – Who doesn’t love shrimp? I feel that seafood in general especially shrimp is so versatile. It goes with almost anything ranging from pastas, rice, stews, salads you name it. Or, it can be served alone as an appetizer which is always a crowd-pleaser for parties big or small. Interestingly, I learned that when serving guests keep it simple and serve dishes you are familiar with and feel comfortable making. It’s not worth stressing yourself out by experimenting with dishes that you’re not sure will be a total success. 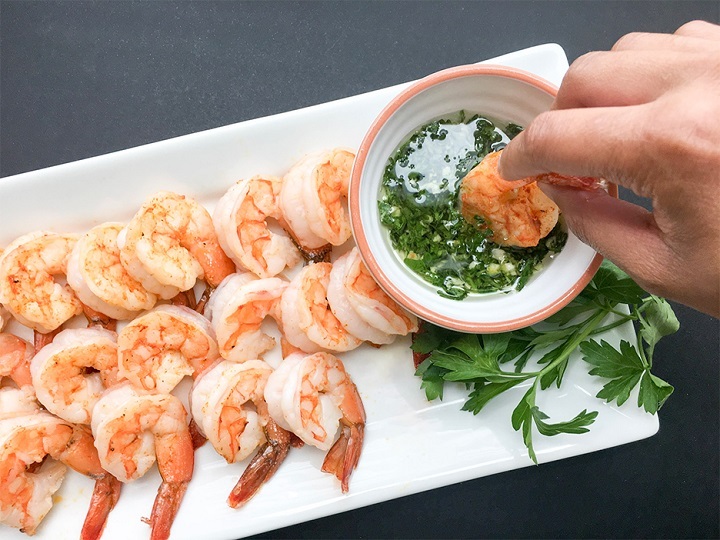 During party planning, try to go with make-ahead dishes where feasible or simple appetizers such as this simple Oven Roasted Shrimp recipe. It’s simple, easy, quick and can be paired with different sauces to enhance the shrimp’s delicate taste. You can opt for the traditional cocktail or butter sauce sauce or whip up a batch of delicious chimichurri. Shrimp: When serving Oven Roasted Shrimp as an appetizer, I prefer the large prawn size shrimp. I’m not 100% sure on the size of these, but I believe they are 8-10 per pound. Their large size with the tail intact makes for a dramatic yet elegant presentation. More importantly, because this appetizer is done in 6 to 8 minutes, you can prepare it the day before or the morning of your gathering by de-veining, cleaning then storing the clean raw shrimp in an airtight resealable bag until you’re ready to place them in the oven. As a side note, this bag of shrimp is normally $33.00 per bag, but I bought it on sale for $13 which was a great deal. I couldn’t resist. It’s the holiday so why not splurge just a little. TIP: It’s important to dry your shrimp before placing them in the oven. After de-veining and cleaning, place your shrimp in a single layer on the baking sheet and pat dry with paper towels removing as much liquid as possible. This is key to achieving Oven Roasted Shrimp. If you do not dry your shrimp, they will steam instead of roast. Sauce: When deciding on your sauce or sauces, choose a sauce that will compliment and not overpower your Oven Roasted Shrimp. The powerhouse of all condiments is chimichurri which pairs beautifully with this dish. When you dip your first shrimp into this sauce, its bright flavor will leave you wanting more. Plate: Arrange each shrimp neatly on a simple tray for your family and guests to enjoy. Tip: Do not overcook your shrimp as it will become tough and rubbery, so it’s in your best interest to watch the time closely and cook the shrimp until it’s no longer opaque in color yet firm in texture. Shrimp is an excellent source of protein and other vitamins and minerals. Since we’re on the topic of shrimp, you might enjoy White Wine Lemon Garlic Shimp Pasta or Skinny Creamy Sun Dried Tomato Shrimp Pasta as a weeknight dinner idea. However, if you have more time on your hands try my Seafood Chicken Gumbo Recipe. You will definitely fall in love if you’re a seafood lover like me. Wash and de-vein shrimp. Do not remove tails. After cleaning shrimp, place shrimp on a single layer on a baking sheet. Remove excess water from shrimp with paper towels. Drizzle shrimp with extra virgin olive oil. Season with salt, pepper, & smoked paprika. Place shrimp in preheated oven and back for 6-8 minutes. Shrimp will turn pink and will no longer be opaque in color. 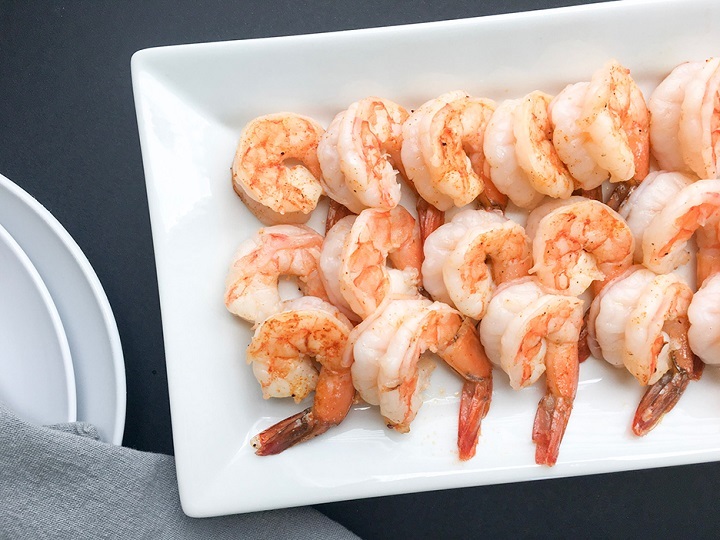 Arrange shrimp on a serving tray and serve with a really good sauce for dipping. Tip: Do not overcook your shrimp as it will become tough and rubbery, so it's in your best interest to watch the time closely and cook the shrimp until it's no longer opaque in color yet firm in texture. oooo…. those look like some tasty lil’ sea bugs. My SO is not a seafood fan, so this is gonna go on my list for when she is out of town and I have a bachelor cooking day (usually things with mushrooms, a t-bone, and some sort of seafood). Hey Ben, Thanks so much. Mushrooms, t-bone, and seafood – definitely winners. You can never go wrong with shrimp. Thanks so much for visiting.